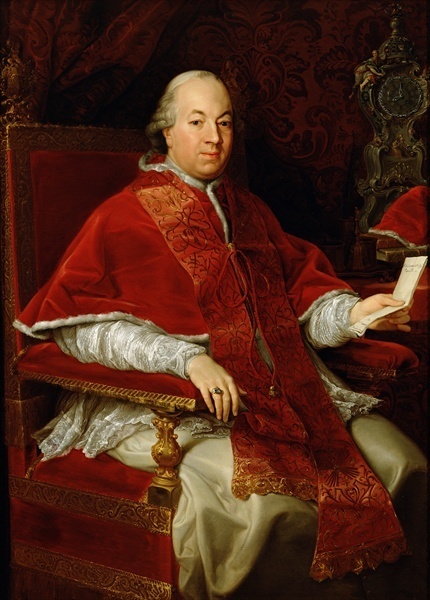 Pope Pius VI (27 December, 1717 – 29 August, 1799), born Count Giovanni Angelo Braschi, Pope from 1775 to 1799, was born at Cesena. The earlier acts of Pius VI gave fair promise of liberal rule and reform in the corrupt administration of the Papal States. Though usually benevolent, Pius VI sometimes showed discrimination. He made his uncle Giovanni Carlo Cardinal Bandi, bishop of Imola since 1752, and a member of the curia, cardinal in the consistory of 29 May, 1775, but did not proffer any other members of his family. He reprimanded prince Potenziani, the governor of Rome, for failing to adequately deal with corruption in the city, appointed a council of cardinals to remedy the state of the finances and relieve the pressure of imposts, called to account Nicolò Bischi for the spending of funds intended for the purchase of grain, reduced the annual disbursements by denying pensions to many prominent people, and adopted a reward system to encourage agriculture. Giovan Angelo Braschi was elected pope on February 15, 1775 at the age of 58. He was confronted with the great changes induced by the Enlightenment in the European society and he had to face the initiatives of many monarchs, in particular the Austrian Emperor Joseph II, aimed at establishing their supremacy in matters such as the appointment of bishops and the definition of their dioceses. In 1882 Pius VI went to Vienna to try to convince Joseph II to reconsider some of the laws he had implemented. The visit was reciprocated by the Emperor in Rome in the next year but, apart from establishing good personal relationships, the initiative of Pius VI had little success. He was a tall man and he had a virile aspect. J. W. Goethe was impressed by these aspects when he saw a celebration chaired by the pope in Palazzo del Quirinale in 1786 and when he attended the ceremonies for the Holy Week in St Peter's in 1788. Pius VI embarked on a large effort to reclaim the marshy plain between the Volsci Mountains (Norma and Cori) and the sea. He enlarged Terracina and visited the area several times. The cost was enormous for the strained finances of the State and the pope was criticized for this initiative, also because the reclaimed land was mainly assigned to his relatives. Papacy. Elected pope, February 15, 1775; took the name Pius VI. Episcopate. Consecrated bishop of Rome, February 22, 1775, by Cardinal Gian Francesco Albani, bishop of Porto e Santa Rufina, sub-dean of the Sacred College of Cardinals, assisted by Cardinals Henry Benedict Mary Stuart, duke of York, bishop of Frascati, and Carlo Rezzonico, bishop of Sabina. Crowned, February 22, 1775, by Cardinal Alessandro Albani, protodeacon of S. Maria in Via Lata. The French took Rome on February 10, 1798, and proclaimed the Roman Republic five days later. Pope Pius VI refused to submit and was taken by force from Rome on February 20, at night. He was taken first to Siena and then to Florence, where he lived at the Charterhouse until March 28, 1799. Although he was seriously ill, the pope was moved to Parma, Piacenza, Turin, then across the Alps to Briançon (April 30, 1799), Grenoble, and finally to Valence (July 13, 1799), where he died. His death certificate, issued by the French authorities, referred to him as "Citizen Braschi".